Add a splash of vibrant colour and unusual vintage style to your interiors with this elegant flamingo table lamp. 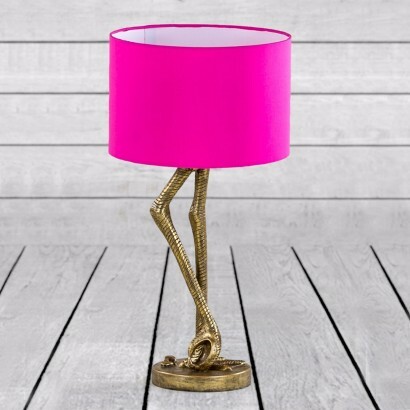 Standing at 60cm tall, this playful vintage lamp base is a pair of slender flamingo legs highly detailed in antique gold coloured metal, and topped with a hot pink shade, this kitsch lamp is designed to capture your attention! Suitable for use with an E27 bulb, place this mains operated lamp anywhere in your home for charismatic style!